One of the many things I love about being a mom is the chance to witness genius. Sure, I’m not alone thinking my kid is a superhero – in truth, all kids are wunderbar – but that does not stop me from glowing with pride at every display of offspring brilliance before me. What’s more, my son doesn’t even have to try to impress – it just comes naturally, like his dimpled smile and summer highlights. His five-year-old one-legged stunt-driving on an electric Razor recommended for 8 years and up, par exemple. His in-depth knowledge of carnivores. His words of wisdom: “You shouldn’t have played soccer in your tennis shoes, Momma!” (Which did end in a torn ligament.) His scientific observations: “Mom, did you know that singing loud can destroy stuff?” His expressions of true love: “When I grow up I’m going to marry you, Mommy” and “I love you like the future.” I have been keeping a journal since the little guy was born, faithfully recording all the funny, charming, creative, truthful and wondrous things he says and does so we both can remember them as years go on. (I’m on the third book already. Bragging rights.) As a writer in constant pursuit of just the right turn of phrase or a fantastic voyage of imagination, seeing my son’s inherent creative fervor is what I find most inspiring. 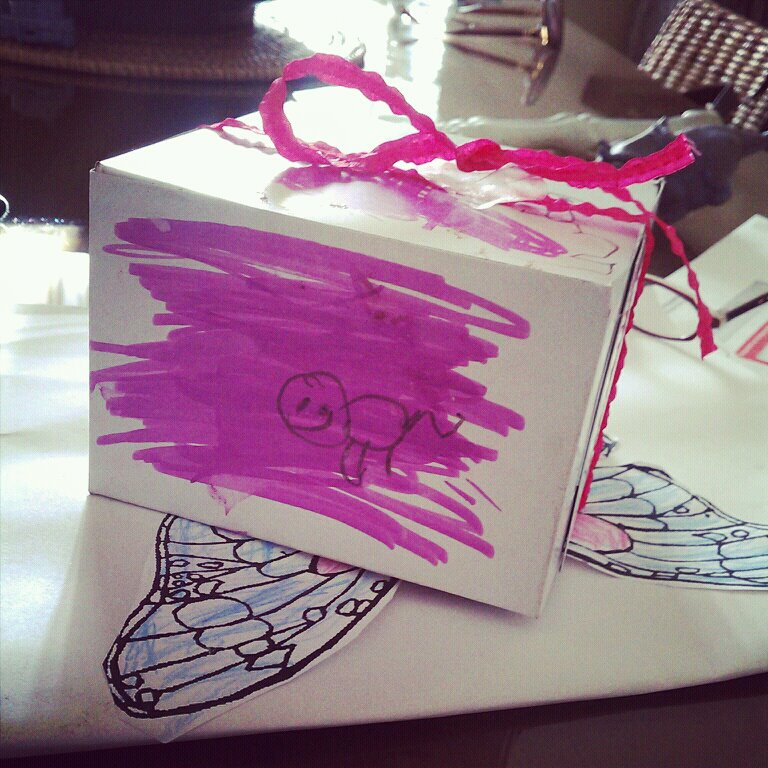 This Mother’s Day I received a box tied in a pink ribbon and covered in little chocolate fingerprints. A typical Kindergarten gift to mom, certainly. But on taking a closer look, I spied on each side of the box a long-tailed animal drawn in pencil atop a fury of purple marker. This looks beautiful, Baby, I said. What is this a drawing of? “Cats in tornadoes.” You can’t teach genius.